In this 2012 photo from the Reality Store Facebook page, students begin their journey by paying their taxes. KAUKAUNA – Kaukauna High School students will get a chance to learn basic skills in financial planning, goal-setting, decision-making and career planning April 25, 2017, during the 11tha annual Realty Store. During Social Studies classes, 11th grade students will visit the Reality Store for a taste of some of the costs of living as an adult and a chance to examine their attitudes about their financial futures and career expectations. 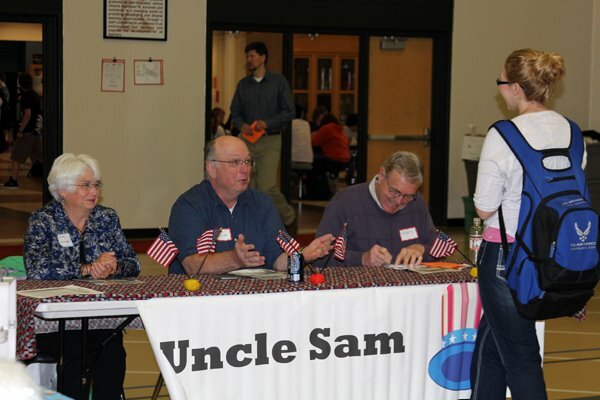 UNCLE SAM – The first stop for the students, where they are required to pay taxes based on their salaries. KONKAPOT CREEK CREDIT UNION – All students are required to stop at this booth after Uncle Sam to set up their checking accounts; they’re given options on savings accounts, Christmas club, and student loan payments. GHOSTLY REALTY – This booth helps students purchase a home suitable for their family size. Taxes and Insurance are included in the price. RIVERSIDE AUTO DEALERSHIP – Volunteers will have the opportunity to be true car salespeople! The idea at this booth is to help students understand what they can or cannot afford, and to persuade them to purchase something more expensive than they can afford to help them understand the repercussions. GRIGNON GROCER – The students choose the category of groceries they would purchase for their family. BLACK AND ORANGE UTILITIES – Students pay for their utilities here, based on their home choice from earlier. EVE OF DESTRUCTION INSURANCE – Car insurance booth, where payment is determined by the type of vehicle purchased earlier in the program. CROOKS AVENUE GAS – Students roll dice to determine their transportation expenses for the month. K-TOWN DAYCARE – Students choose the type of daycare they needed for their family. GROOM AND GLITTER – Costs associated with this booth included haircuts, make-up, soap, deodorant, etc. GHOSTTOWN FASHIONS – Students have a chance to make fashion options based on their career choices, and have the option to purchase clothing for their children as well. 1,000 ISLANDS VACATIONS – All work and no play is unhealthy; this booth will be set up to help students plan entertainment and vacations, and to prepare for saving up for these things. GALLOPING GHOST PET AND VET – This booth will help students realize the cost of maintaining a pet. If they choose to keep pets, they needed to select a service from this booth’s chart. FATE – Students visit this booth twice to draw numbers for their “fate” listed on a chart; some categories include surgery, work bonus, lost job, etc. SOS – This final booth will help students get out of financial trouble in the smartest ways possible. Volunteers will help students come up with ideas on how to save money throughout the “month” by having a grandparent babysit, sharing housing with someone, or reevaluating their purchase and scaling down.